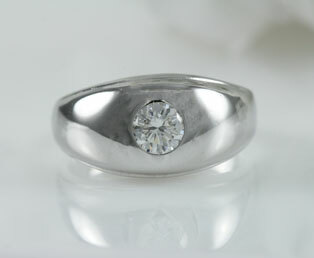 One single diamond shines brightly in this gentleman's diamond wedding band in a 14kt white gold gypsy setting. 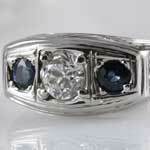 The radiance of this diamond is framed by a wide, smooth finished white gold gypsy band mounting. This bright white diamond solitaire measures over 1/2 carat ( 0.65 carat weight, VVS2, F ). 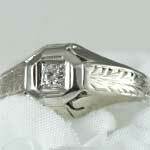 One flush-set round brilliant-cut diamond appx .065 carat weight, 5.51- 5.55 x 3.39mm depth, Clarity Grade: VVS2, Color Grade: F.